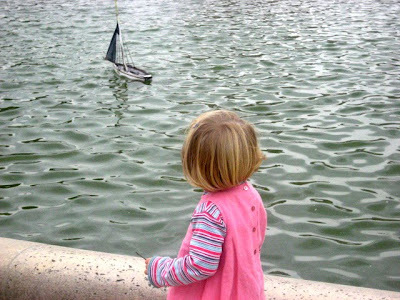 Our rented apartment is next to the Jardin du Luxembourg. 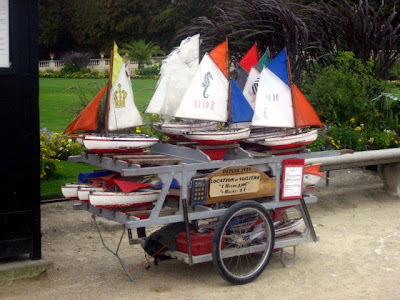 There are beautiful fountains, sculpture, flower gardens, bee hives, marionette puppet theatres, heirloom pear trees and rental boats for children daily here. It is my favorite spot in all of Paris. 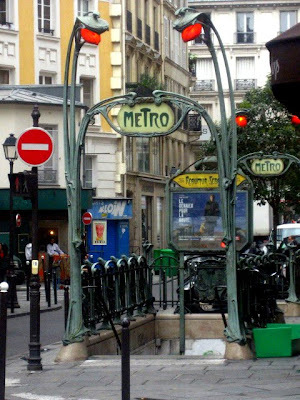 Beautiful metro stations with gorgeous Art Nouveau ironworks abound. Typical teenagers, sitting around laughing, and smiling in large groups. 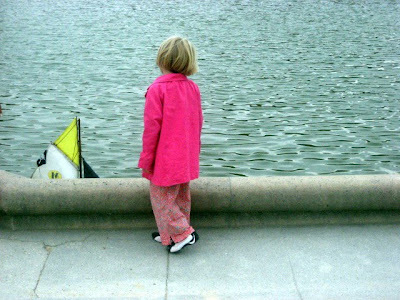 We have NEVER seen a young person texting on a cell phone and NO ONE carries a water bottle or cup of coffee to go. How refreshing! A visit to Rue Mouffetard, a fantastic marketplace in Paris is a must. 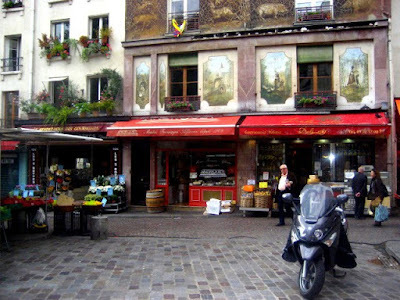 A beautiful cobblestone street is lined with fantastic fromageries (cheese shops), boucheries (specialty butchers), boulangeries (bakeries), cafes and outdoor produce markets. 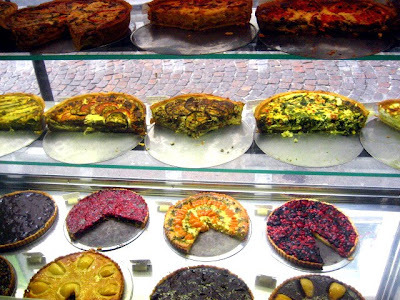 There was a place just for quiches called Mouffe Tarte! I tried the fig and chevre and the Provencal with eggplant and tomatoes.......DIVINE! 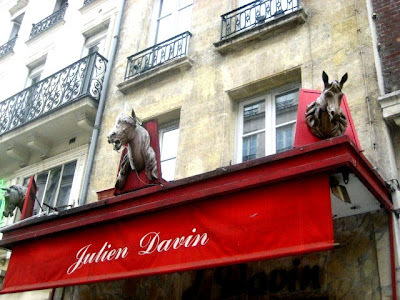 Julien Davin is one of the few remaining horse butchers in the city. Yes, the French eat horsemeat (and any other kind of meat, for that matter), though it is slowly declining. The city has 32 chevalines left, 20 years ago there were over 100. Horse meat is banned in restaurants, but I guess the old school French people still desire it. Though I could peek into the shop and see the butcher at work, there were iron gates down, to discourage animal rights protestors. 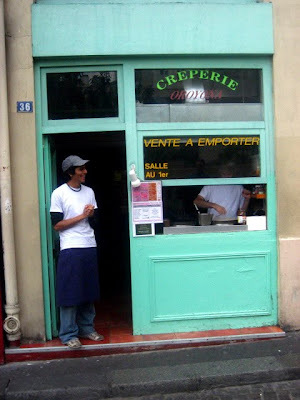 Read this interesting article on horse meat in Paris, it explains a lot. This is one thing I will be not be eating anytime soon (or ever!). 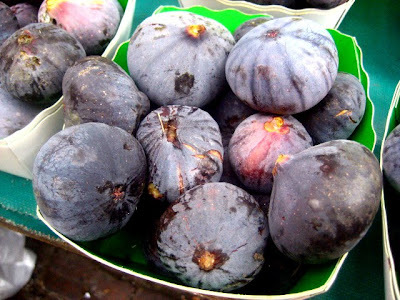 and lastly, what would a trip be without me finding fresh figs? They were all over the markets and the size of small apples. Each one heavy with sweetness, ripe and the perfect pairing to wine and cheese each evening. I would have been shocked if our Stacey had come back without eating or posting about figs in Paris. Your photos really make me wish I were there right now. Another friend of mine went to Paris 2 years ago & that same horse meat butcher. He actually bought some to cook up & quite enjoyed it. Happy New Year! Love your Paris posts! How will you ever force yourself to board the flight home?!?! Lucky you! You are still in Paris! Great pictures and information! I love reading your posts every morning. The figs are probably great in France but my neighbor gave me 2 bags last week fresh from the tree. I amde a pear and fig galette which I will be posting next week. How fun and how interesting! Can't wait to read about the horses from the link you provided. Figs, cheese and wine sound like a perfect snack! I love love love these posts. Thank you for taking me back to Paris! Wow, I can't imagine a place where nobody is texting or drinking coffee! Looks beautiful... Have fun! I can explain the mystery - you never see a teen texting in the street because they come to my classes to text. They're all there. 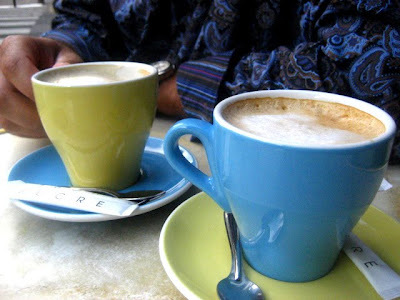 I can just imagine you sitting out at a cafe, people watching and taking it all in! La Dolce Vita!! Aaaaaack! I must cover my horse's eyes. I have a hard time dealing with horses being slaughtered. Whew. 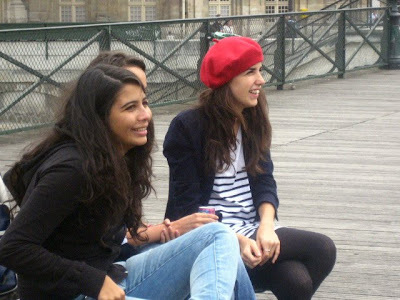 Your pictorial visit to Paris is something I am thoroughly enjoying. I cannot wait to visit Paris. Hubs and I have it high on our list. BTW, I made a fabulous fig jam that I'm going to post this week. I totally thought of you.